Yesterday was New Beer’s Eve, today April 7 is National Beer Day, an opportunity for American beer enthusiasts to celebrate their favourite brew. 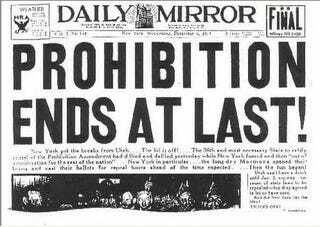 The day marks the enactment of the Cullen-Harrison Act in 1933 allowing the sale of beer in the US for the first time in 13 years. Somehow 1.5 million barrels of booze where available to drink on that first day. It used to be that denizens of Dublin who were a little too fond of a tipple could check into a rehab center - opposite the aromatic Guinness Brewery. With similar efficiency it is also National Alcohol Screening Day, a chance to check if your booze intake falls within acceptable levels. The World Health Organisation is targeting diabetes for World Health Day 2016, something that affects around 442 million adults around the globe. They aim to improve awareness of the rise of diabetes, the burden and consequences, particularly in low and middle income countries and how to scale up prevention and strengthen care. If you can find a sugar-free slice of cake it is also National Coffee Cake Day but beware of National No Housework Day because if you don’t do it today there will be twice as much to do tomorrow.